Aerotech is launching a new 560mm wide ball screw-driven positioning stage as part of its PRO range of hard top/side sealed precision tables. Available in standard and high-speed versions, the extra-wide cross-section the new PRO560 and PRO560 HS stages provides support for long-travel upper axes or large-footprint loads. With travels of up to 1500mm and load capacities of 150kg, the new stages enhance the PRO ball screw-driven range that covers stage widths of 115, 165, 225, 280mm and now 560mm. The PRO ball screw range is characterised by its innovative and fully protected side-sealed/hard top design and includes heavy-duty linear bearings for arduous yet high-precision industrial positioning applications such as laser welding or electro-discharge machining (EDM). The aluminium hard top cover and vertical side seal deflect debris and fully protect the internal stage components. Optional tabletops are also available that can include a brush assembly to remove machining debris from the cover. This stage sealing system is said to be much preferred to conventionally sealed stages that use bellows or slide plates that can ingest debris, resulting in eventual sealing failure and replacement. Through the PRO560 range, six models are available with travels from 300-1000mm with maximum speeds of 220mm/s for the 300mm travel stage (140mm/s for the 1000mm version). For the PRO560HS, eight models provide travels from 300-1500mm with speeds to 1050mm/s for the 300mm version (300mm/s for the 1500mm version). Both types offer a horizontal load capacity of up to 150kg. The PRO560 is equipped with a precision ground 5mm pitch ball screw and a 2500-line motor-mounted encoder for a positioning resolution of 0.5um and bidirectional repeatability of +/-1um. The 25mm pitch ball screw and 2500-line encoder on the PRO560 HS yields a resolution of 2.5um and repeatability to +/-2.5um. Nominal straight line accuracy for both stage types is +/-17.5um for the 300mm travel versions. Motor mounting is via a NEMA 34 compatible flange that accepts Aerotech high-performance brushless servo motors or third-party brushed DC and stepper motors. Motors can be mounted in-line with the ball screw or side-mounted on the right or left side of the stage with the 'foldback motor' option to save space. A motor-mounted brake is available as an option for vertical mounting or for applications requiring a higher level of safety. End-of-travel limit switches are available in 5V and 24V options. 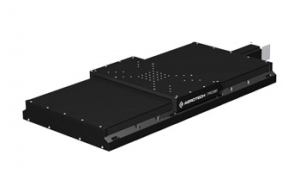 Further options include a wide choice of tabletops with metric or imperial threaded hole patterns to suit the various widths of matching PRO series stages or other Aerotech linear and/or rotary stages. Alternative accuracy levels for orthogonal alignment are available for X-Y mounted systems and toe clamps are available for base-mounting the stages. As with all Aerotech positioning mechanics, customised interfacing plates and brackets are offered, together with complete machine base/frames, and provision can be made for air or hydraulic services, or any other customer equipment.